Marco, Greetings from Chicago! It has been four months since my wife Lisa and I were in Florence. It was in October, roughly the 16th and we were the only two on the tour. I'm sorry it has taken this long to send a letter to you, as I remember our discussion about staying in touch after. Hopefully you remember us, we had good conversation along the route and a fun time tasting the wines at the two vineyards. It should come as no surprise that the wine and olive oil has been shared and consumed quickly. Thanks again for such a wonderful tour. It was a perfect way to end our Italian vacation! In the chance that you are in the Chicago area let us know. It would be a pleasure to show you around and converse over a good American wine. I hope this e-mail finds you well and happy in the new year. Take care and we'll be in touch. 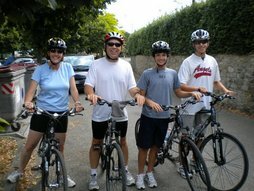 Our day biking through Tuscany with you was a highlight on our trip. Your knowledge of the region helped educate us as we went along. Your biking smarts got us off to a good start and kept us going all day. And your flexibility and willingness to meet our needs helped to personalize the day with unexpected wonderful results. 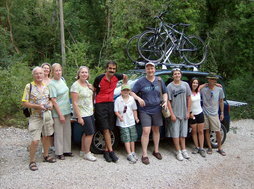 You have our thanks for making our biking day in Tuscany the best day on wheels we’ve had in a long time. We had such an amazing time!!! Thanks again for all you did for us. We loved every minute…… well maybe not EVERY minute! I can think of a hill or two that I didn’t love! The winery, cheese farm and all of the awesome restaurants were the best! It was so fun to meet you and spend time with you! You were an awesome host! Thanks so much for the Calendar and map! We’ve had fun showing our families! I hope your Fall is wonderful. Enjoy your beautiful weather because we came back to snow in Montana!!!! We’d love to stay in touch and maybe see you in Montana someday! Thank you for a wonderfull day spent this summer. Here is the picture with all of us! Wow what a time, we made it 22km's and only two wipe outs. The Tuscan country side was wonderful to see as we made our way slowly up the hills to the restaurant at the base of Castello di Brolio. It was a wonderful break and place to re-charge for the second portion of our trip. There are so many wonderful things that I could say but words cannot express our thanks for your making our time so very special...So from Sebastiano to Lorenzo (thanks for being my guide) from Adam to Marco (thanks for giving me a lift down the hill after my wipe-out. Cheers! 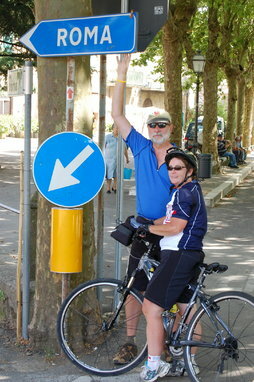 CONGRATULATIONS to Susie Bradley who completed ALL 168 miles of the Florence to Rome tour. And congratulations also to husband Bob who came in a close second. GREAT JOB!!! Hi Marco - I wanted to thank you again for our wonderful bike tour. We all agreed that it was one of the best things we've ever done. 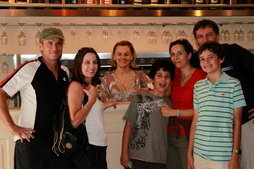 You and Lorenzo were perfect hosts and made the experience unforgettable. Thanks again and I'll always recommend you to anyone I speak to.